Consider how we measure elapsed time. If we use a stopwatch, for example, how do we know when to start and stop the watch? One method is to use the arrival of light from the event, such as observing a light turning green to start a drag race. The timing will be more accurate if some sort of electronic detection is used, avoiding human reaction times and other complications. Now suppose we use this method to measure the time interval between two flashes of light produced by flash lamps. (See this figure.) 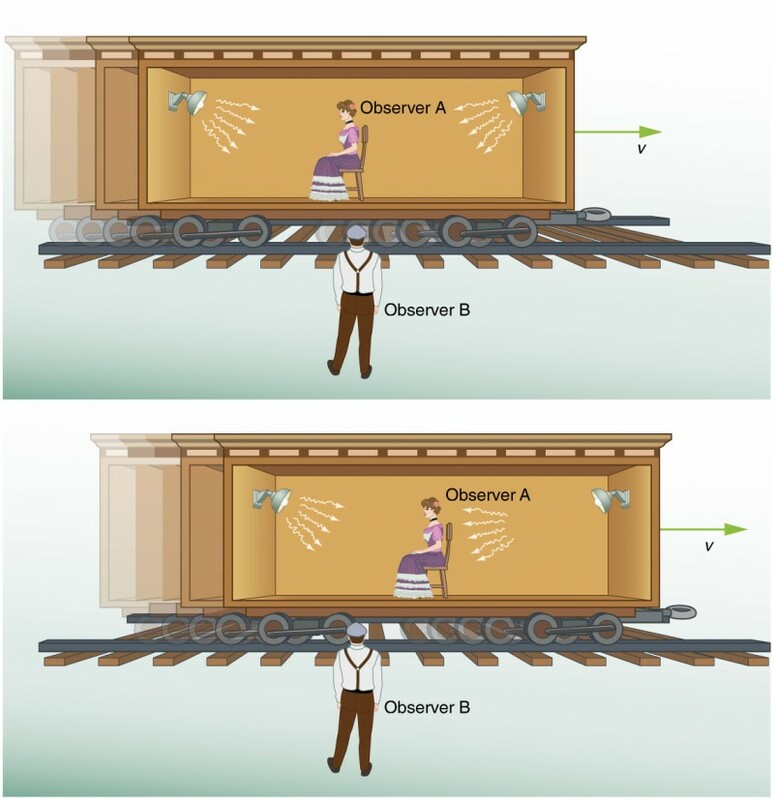 Two flash lamps with observer A midway between them are on a rail car that moves to the right relative to observer B. Observer B arranges for the light flashes to be emitted just as A passes B, so that both A and B are equidistant from the lamps when the light is emitted. Observer B measures the time interval between the arrival of the light flashes. According to postulate 2, the speed of light is not affected by the motion of the lamps relative to B. Therefore, light travels equal distances to him at equal speeds. Thus observer B measures the flashes to be simultaneous. Observer B measures the elapsed time between the arrival of light flashes as described in the text. Observer A moves with the lamps on a rail car. Observer B perceives that the light flashes occurred simultaneously. Observer A perceives that the light on the right flashes before the light on the left. Now consider what observer B sees happen to observer A. Observer B perceives light from the right reaching observer A before light from the left, because she has moved towards that flash lamp, lessening the distance the light must travel and reducing the time it takes to get to her. Light travels at speed \(c\) relative to both observers, but observer B remains equidistant between the points where the flashes were emitted, while A gets closer to the emission point on the right. From observer B’s point of view, then, there is a time interval between the arrival of the flashes to observer A. In observer A’s frame of reference, the flashes occur at different times. Observer B measures the flashes to arrive simultaneously relative to him but not relative to A. This illustrates the power of clear thinking. We might have guessed incorrectly that if light is emitted simultaneously, then two observers halfway between the sources would see the flashes simultaneously. But careful analysis shows this not to be the case. Einstein was brilliant at this type of thought experiment (in German, “Gedankenexperiment”). He very carefully considered how an observation is made and disregarded what might seem obvious. The validity of thought experiments, of course, is determined by actual observation. The genius of Einstein is evidenced by the fact that experiments have repeatedly confirmed his theory of relativity. In summary: Two events are defined to be simultaneous if an observer measures them as occurring at the same time (such as by receiving light from the events). Two events are not necessarily simultaneous to all observers. This article has been modified from "Simultaneity And Time Dilation," by OpenStax, College Physics, CC BY 4.0. Download the article for free at http://cnx.org/contents/031da8d3-b525-429c-80cf-6c8ed997733a@14.2. This is a lesson from the tutorial, Special Relativity and you are encouraged to log in or register, so that you can track your progress.